"My expectations were immediately realized when my Radar Pitching Trainer was purchased. It has added a degree of motivation for my pitchers participating in their off-season training programs. The Radar Pitching Trainer has added another coach to my staff." 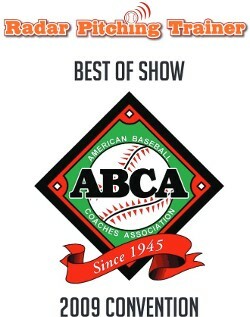 "The Radar Pitching trainer is a fantastic new technology. Our students really enjoy training with the item. We're using it with a wide range of kids for baseball and fastpitch softball. We look forward to rolling them out to our facilities." "The Radar Pitching Trainer has great value and benefit. It challenges my students to hold speed standards for each moving pitch, to be accountable for the zones of the plate, to manage their pitch count and to practice more competitively against their own scores or versus other students. I can verify its accuracy as I have tested it against two high-end radar guns. And the price is very affordable. You get the benefits of a pitching screen target, a radar gun, and an electronic game. It's a great product!" "The Radar Pitching Trainer worked great. We put it to the test with five to six high school and college pitchers throwing bullpens every week through the summer. Our pitcher's love to train with this product."